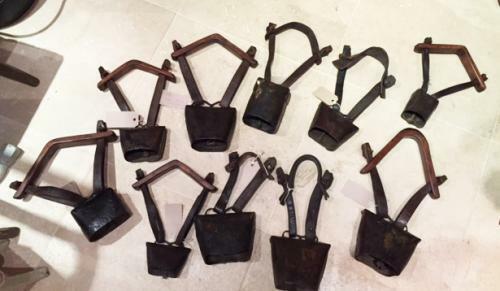 We are pleased to have a good selection of rare 19th Cent Shepherd’s Clucket Bells of various types, Clucket Bells, Sussex Square Canister Bells some on straps, some on hardwood yokes, all with clappers. Prices £85 to £110/bell depending on design and rarity. Many of the bells have evidence of brass on their surface. Originally these bells were coated in brass to improve their resonance however this wore off over many years of wear. All these bells are English, hand made by Tinkers and not to be confused with the mass market continental bells.